Earlier in my journal entry on the Fissure of Woe, I mentioned the requirements needed to enter the gods’ realms are steep. Finding enough skilled adventurers willing to enter the Mists is a challenge in itself. It’s no surprise that mortals shy away from the land of the dead. Through my connections in a guild, I persuaded seven individuals to accompany me into the Underworld and explore every section accessible. Elwin, Selenium, Dark One, Magic D., Bunny S., Solorian and Mini S.T. 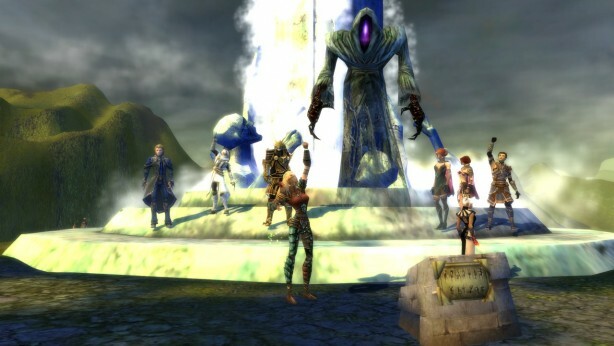 grouped up by Grenth’s statue in the Temple of Ages before giving the Voice of Grenth our offering to enter his domain. Once Gwen started traveling with our group, it didn’t take long for her to hear rumors about her mother roaming the Underworld in search for her. Because Sarah is a ghost and resides in the Underworld, I had to bring Gwen into the Mists to see her mother. At least for a few moments, Gwen was able to drop her guard and let Sarah mother her. I’ve seen the way Gwen shuts everyone out and hides her emotions. Even though her mother is a ghost, and we both know nothing will bring her back, at least Gwen’s scarred heart can be mended here. Their reunion turned out better than I had hoped for. Sarah was so happy to finally see Gwen alive. She had some advice regarding where her daughter was taking her life, which I’m not sure Gwen appreciated so much, but it was good to see them together. 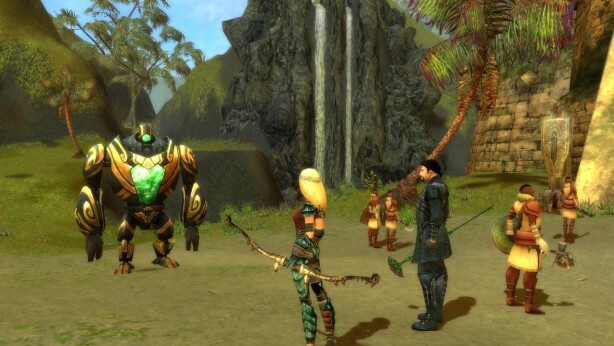 Tyria contains many dangers and challenges for adventurers to seek and overcome. But the Mists present a whole new level of difficulty. Two such challenges; the Fissure of Woe and the Underworld, have a steep barrier of entry. Your party of adventurers must be deemed worthy by either the god Balthazar or Grenth to enter their realms (the Fissure of Woe and the Underworld respectively). In addition to this requirement, they provide very little information on what you’ll encounter, and the challenges you overcome do not effect Tyria. Access to these challenges can be found on every continent. 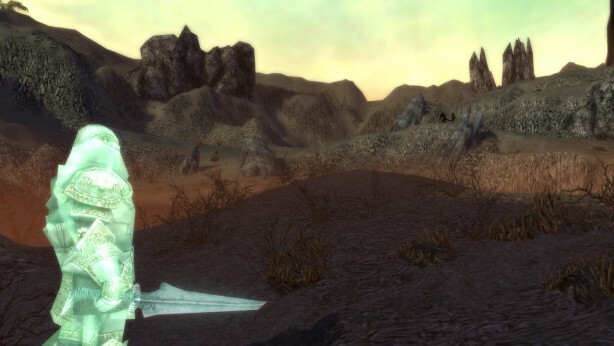 The Temple of Ages in Kryta, Lornar’s Pass in the Shiverpeaks (Underworld only), Zin Ku Corridor in Kaineng City, the Chantry of Secrets in Vabbi, and finally via the appropriate scroll in Embark Beach. I was fortunate enough to find several adventurers that were willing to explore the Fissure of Woe. 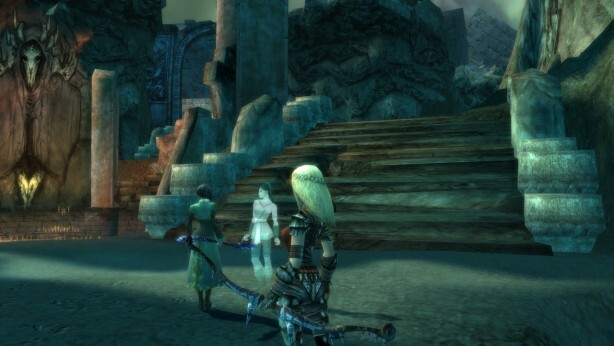 Elwin L., Heet K., and Rogoth I. all met Balthazar’s requirements of entry, and we recruited several other heroes from Tyria to join us. As we entered the Fissure of Woe, a ghostly warrior named Rastigan the Eternal informed us of the situation in this realm. Balthazar’s half-brother Menzies has invaded the Fissure of Woe with his Shadow Army. This war has pushed Rastigan out of the Tower of Courage, and our test is to help Rastigan reclaim it.